RUT IWM main index leader blasted to new highs and above YR2. SPX made a new high, but testing HR1. NDX also in a resistance cluster of QR1 HR1 then YR2 above. DJI and NYA bringing up the rear, not yet at long term resistance. So the thing to no is watch the reactions at these levels. Given the trend of the second half, I think SPX will clear HR1. But I am not so sure that NDX will clear YR2 on the first try. This will be an interesting level to watch. I suppose RUT clearing increases the chances that NDX will do so; however, if pros wanted to lighten up on tech this is where it would happen. SPX W: Above YR1 for the 4th bar in a row and soon testing HR1. Above that would start to target YR2, 2987. SPY D: SPY already at HR1; this week had 2 days of pause, one day weak selling and then a confident advance. ES D: Last touches of monthly pivots have been near key lows, AugMP and Jul HP MP area. 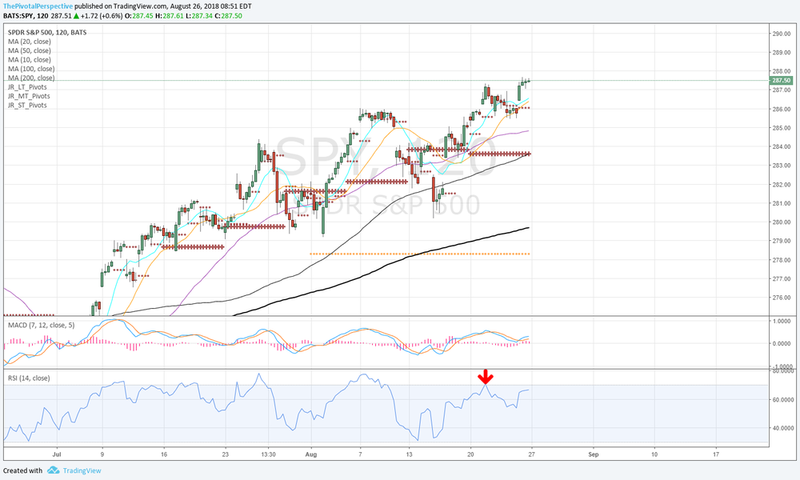 SPY 2H: Latest overbought reading briefly sold, but right back higher in a few days. 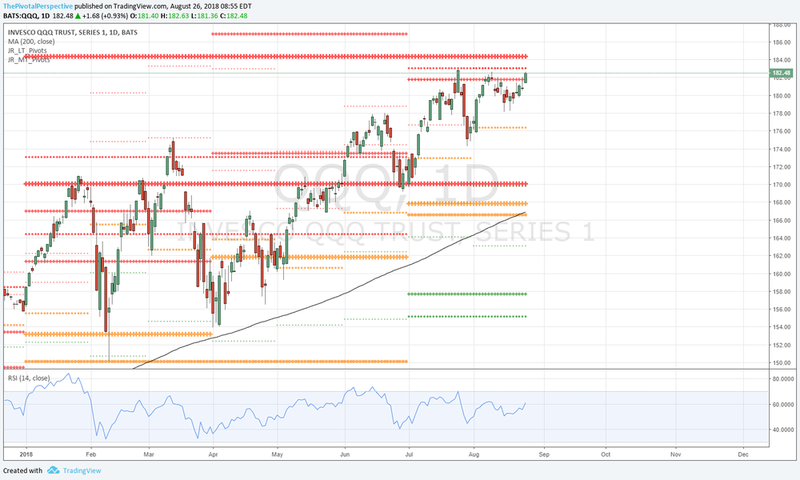 Last time near oversold quickly scooped up - bullish action. SPX sum: SPX breaking out to new highs with HR1 and MR1 (AugR1) just above. Confidently moving to level with just a 2 day brief pause and 1 day weak selling before. Watching for reversals this week but so far strength pointing to getting above. This is especially the case if you consider the market from 2018 second half which is trending up quite nicely, compared to the choppy 2 steps forward 2 steps back of most of the first half. NDX W: Heading into HR1 and YR2 just above. This will be an interesting area to watch. QQQ D: QR1 cleared, HR1 and YR2 just above. NDX sum: Helps the bull case for tech to be getting in gear but still in important resistance cluster of QR1 HR1 and especially YR2. If pros wanted to lighten up on tech this is where it would happen so carefully watching reaction from this area. DJI W: Not at long term resistance yet. Weaker up bar may invite selling. DIA D: AugR1 a bit higher then HR1 also in play before it reaches the 2018 high. DJI sum: More work to do to test long term resistance, and 2018 high seems a bit far at this point. RUT W: Got through YR2 as planned from last week. IWM D: Breaking out above a 3 month consolidation. RUT sum: Nice looking clear of YR2 so low opportunity cost to hold for higher levels. W: Still stuck in range of Feb high and low. D: Above QR and recently held HP D200MA combo. NYA sum: Recent hold of HP and D200MA added to the bullish picture for markets overall. However, clear that international names are still the weak link.